I have long been a proponent of organizations understanding their रोजगार मूल्य प्रस्ताव (EVP) क्योंकि जबरदस्त लाभ है कि योग्य प्रतिभाओं को आकर्षित करने के मामले में प्राप्त किया जा सकता की, कर्मचारी प्रतिधारण, और कर्मचारी सगाई. वास्तव में, EVP is so powerful that it impacts almost every aspect of Human Capital Management, including all the HCM practices, such as talent acquisition, प्रतिभा प्रबंधन, and learning and development– and HCM technology. Defining an EVP is not an easy accomplishment because it requires a comprehensive and objective assessment of every facet of the organization from both the organizations’ and employees’ perspectives. It also requires collaboration and agreement on what constitutes the organization’s EVP and both internal and external communication of the EVP. I say it is not an easy accomplishment because according to Brandon Hall Group’s 2015 EVP survey, 67% of organizations surveyed do not understand the components of their EVP and only 15% have a well-defined and communicated EVP. So I was particularly pleased when Cliff Stevenson, Principal Analyst for Workforce Planning, और मै, Principal Analyst for Talent Acquisition, were chosen to lead the workshop – Engaging Employees Through a Powerful EVP at ब्रैंडन हॉल समूह'एस HCM उत्कृष्टता सम्मेलन 2016 at the beautiful PGA National Resort and Spa at Palm Beach Gardens, फ्लोरिडा. We had the honor of introducing Brandon Hall Group’s new EVP Framework and getting organizations’ first-hand reaction to it and understanding how EVP plays a role in their organizations. We also wanted their input in terms of what drives those pillars within their own organization. I was really looking forward to a meaningful discussion. 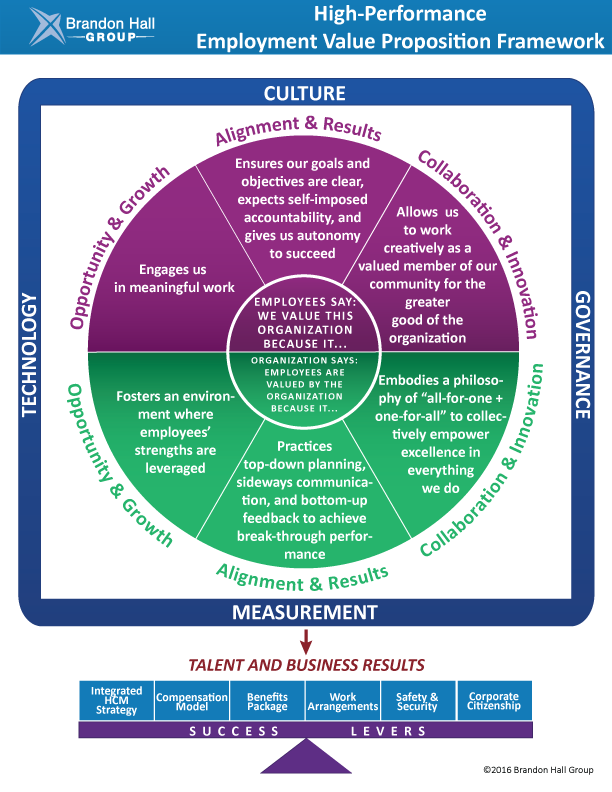 The BHG EVP Framework, based on significant research conducted by Brandon Hall Group, not only clarifies the components, or pillars, of every organization’s EVP, it guides organizations on how to express or think about each pillar from both the employee and organization perspective. The pillars are Opportunity and Growth, संरेखण और परिणाम, and Collaboration and Innovation. The framework also shows the critical success levers, or critical success factors, that need to be in place in order for the organization’s EVP to be effective. And it demonstrates that an organization’s EVP is impacted by an organization’s – technology, संस्कृति, शासन, और माप. The workshop was dynamic! Our room was overflowing with attendees and we heard from many organizations about the programs they have implemented to drive their EVP. One attendee emphasized that at her organization, “diversity of thought is encouraged” to drive innovation. Another attendee spoke about encouraging employees to take risks and possibly fail to drive innovation. Another person commented that it is not only necessary to communicate the EVP, but that “actions speak louder than words” and that “it’s what an organization does” that really tells that organization’s EVP story. And one more spoke about the importance of “understanding the purpose of an organization” in order to assess its EVP. I could go on and on. We had so many great comments. A white paper along with Brandon Hall’s EVP framework will soon be released. We are very hopeful that this framework will help more organizations embrace, को परिभाषित, and convey their EVP because if they do, it will pave the way for high-performance. दारिया फ्राइडमैन ब्रैंडन हॉल समूह के लिए प्रतिभा अधिग्रहण अभ्यास की देखरेख प्रधान विश्लेषक है. ब्रैंडन हॉल से पहले, दारिया बर्नार्ड Hodes समूह के लिए अनुसंधान अभ्यास नेतृत्व में, एक भर्ती समाधान एजेंसी, और Findly, एक प्रतिभा अधिग्रहण सॉफ्टवेयर सेवा प्रदाता. दारिया का ध्यान ऐसे उम्मीदवार अनुभव के रूप में विषयों पर प्रतिभा अधिग्रहण अनुसंधान के संचालन पर है, नियोक्ता मूल्य प्रस्ताव सत्यापन, ज्ञानप्राप्ति, उम्मीदवार अनुभव, अवधारण, आंतरिक संचार, कैरियर साइट मैसेजिंग, प्रतिभा पूल आकलन / आपूर्ति और मांग, कर्मचारी को काम पर लगाना, परिसर / स्नातक भर्ती, ब्रांड धारणाओं / स्थिति, सर्वोत्तम प्रथाएं, विविधता, बाजार / प्रतिस्पर्धी गतिशीलता, प्रतिभा अधिग्रहण मेट्रिक्स, स्रोत के-भाड़े / नौकरी खोज गतिशीलता, नियोक्ता वरीयताओं, कर्मचारी लाभ, प्रौद्योगिकी खरीद वरीयताओं, और अधिक. वह Hodes पर कई सोचा की अग्रणी और पुरस्कार जीतने अनुसंधान अध्ययनों का उत्पादन किया गया, समेत: हेल्थकेयर प्रतिभा मेट्रिक्स, नियोक्ता ब्रांडों की बढ़ती मूल्य, जोखिम में RNs, कॉलेजिएट कैरियर की मानसिकता, रोजगार वार्तालाप - कैसे सामाजिक वेब पर नियोक्ता और प्रतिभा को पूरा, और के लिए खेल रहा है बनाए रखने के लिए भर्ती / रखता है. दारिया उद्योग मैटर्स विकसित, एक आर्थिक और प्रतिभा अधिग्रहण प्रवृत्ति नजरिए से दोनों प्रतिभा परिदृश्य पर अंतर्दृष्टि प्रदान करता है कि एक मासिक समाचार पत्र. वह कई उद्योगों में विश्व स्तर पर अनुसंधान का आयोजन किया गया, ऐसे में स्वास्थ्य के रूप में, प्रोद्योगिकी, बीमा, पूंजी, अतिथि सत्कार, दूरसंचार, रक्षा, कानून प्रवर्तन, और खुदरा. दारिया मात्रात्मक में कुशल है, गुणात्मक और माध्यमिक अनुसंधान के तरीके. 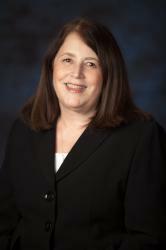 Daria has an MBA in Marketing from Fairleigh Dickinson University and a BA in French from Montclair State University.